PAUL JAY, SENIOR EDITOR, TRNN: Hi. Welcome back to The Real News Network. I’m Paul Jay in Washington. 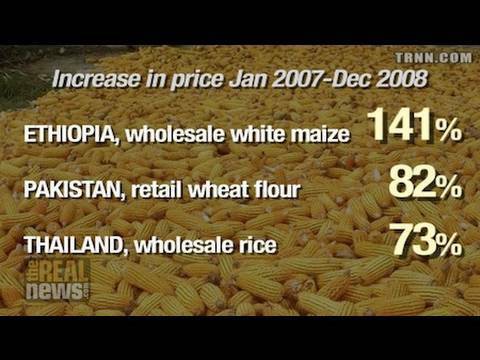 From 2007 to 2008 the price of maize in Ethiopia went up 141 percent, retail wheat flour in Peshawar, Pakistan, went up 82 percent, rice in Thailand up 73 percent, and so it went throughout the world. Our guest believes we’re at the start of another surge in global food prices, and has little to do with supply and demand and much more to do with speculation by global finance companies—and, what a surprise, that includes Goldman Sachs. We’re now joined by Jayati Ghosh. She’s a professor of economics at the Centre for Economic Studies and Planning at the School of Social Sciences at the JNU in New Delhi. Her recent book is titled After Crisis. And she joins us from the PERI institute in Amherst, Massachusetts. Thanks for joining us, Jayati. JAY:So what is the indication we’re at the beginning of another global surge in food prices? GHOSH: Well, actually, globally the world trade prices of food have been rising since about April 2009, and all the indications are that they’re rising for the same reasons that they rose way back in 2007-2008, which is to say that it’s not driven so much by global supply and demand factors, but it’s driven by financial involvement in the commodity futures markets. JAY: Now, I’ve read some of the background material, and in your writing you point out that production is up. Demand has not risen significantly, yet prices are way up. That seems to be a disconnect from what normally governs such things. GHOSH: That’s right. And I want to first break one of the very common myths. There is this perception that world food prices are rising because China and India are eating too much, basically that, you know, there is new prosperity in these countries, and that is leading to a rise in food demand. In fact, when you look at it, aggregate food consumption in both China and India and food grain consumption is down, it’s not up, and this has been happening for the last decade, really. So it reflects income distribution in these countries, it reflects changing patterns of consumption, but it’s simply not true that it’s because the Chinese and the Indians are eating more. It’s not just per capita food grain consumption that is coming down; it’s the total food grain consumption of these countries that has been coming down. JAY:So how does this work? Demand’s going down and prices are going up. GHOSH: Well, yes, but essentially what’s happening is that it’s not that demand is going down. Global demand is kind of stable when you talk about utilization. And global supply is volatile, but it’s volatile around a stable trend as well. In fact, over the last year, supply has risen faster than utilization, and stockholding has gone up. Now, normally people would say, okay, this is a time when prices should come down. But prices haven’t come down. Prices have actually gone up from April 2009. This is really driven by financial speculation in the commodity futures markets. This is exactly what was happening from January 2007 till about June 2008, which is when you had the entry of what are called index traders, who were basically entering the futures market, holding long positions, and recycling them to actually gain from the advantage of rising prices. And this was intimately related to financial deregulation. In 2000, the United States government passed the Commodity Futures Modernization Act, which allowed a whole range of non-grain players to enter the grain markets, the futures markets. There’s something called a swap-dealer loophole. I won’t go into the details, but it basically allows companies that do not deal in grain trade to hold these kinds of contracts, and that included pension funds, hedge funds, you know, you name it, and banks, investment banks—everybody enters this market. GHOSH: No, this is really talking about government stockholding and reserves. Hoarding is when individuals or small shopkeepers, or even companies, are holding it in anticipation of the price rise, and this used to be how people speculated in grain. But you have to hold the commodity. What’s happened now, what’s happened, really, in this decade, is that the possibility of speculation in food grain has been delinked from the physical holding of the commodity: you don’t need to hold a commodity anymore; you can hold pieces of paper, which are contracts on the price for the future. GHOSH: Well, really what happened—. Okay, let me first explain that there is an underlying perception that globally there will be an imbalance. And I think that perception is correct, because there isn’t an imbalance today in terms of real demand and supply, but that’s because we are underfeeding a large part of our global population in Sub-Saharan Africa, in South Asia, and we are not investing enough in terms of improving food supply, we’re not doing enough in terms of public investment in agriculture, in terms of making farming viable, in terms of new research and extension. So there is an underlying problem, and I think markets sense that underlying problem, although it’s not an actual problem today. But what tends to happen now is that when you look at the pattern of investment in these grain markets in terms of the futures markets, there’s been more and more involvement of the non-grain dealers in what is called over-the-counter trade, OTC trade, and that was something that was allowed through this 2000 deregulation. From about late 2006, a lot of financial firms—banks and hedge funds and others—realized that there was really no more profit to be made in US housing market, and they were looking for new avenues of investment. Commodities became one of the big ones—food, minerals, gold, oil. And so you had more and more of this financial activity entering these activities, and you find that the price then starts rising. And once, of course, the price starts rising a little bit, then it becomes more and more profitable for others to enter. So what was a trickle in late 2006 becomes a flood from early 2007. JAY: So is this another bubble that’s being deliberately created by finance? JAY: And is this a bubble that at some point burst? I mean, in a sense there’s endless demand for food. The only reason there isn’t more demand is people can’t afford it. JAY: But you’re saying this is almost an anomaly. They cashed in in order to take out their losses or deal with the losses in the subprime mortgage crisis. JAY: So your basic point is we’re at the beginning of a whole new bubble. GHOSH: Absolutely, because what you find from about March/April 2009 is that the prices have started rising again, and more and more of these investors, index investors, as they’re called, have now started entering and buying OTC contracts in the forward market. And this is because there is really no reason for them not to do that, because they’re getting very cheap interest, they’ve got a huge moral hazard because they know they’ll get bailed out if there’s a crisis, and this is a very profitable avenue of investment at the moment. JAY: Yeah, that’s an important point I read in your material, that because interest rates are so low, and the downside of failure doesn’t actually seem to be much of a downside because the various governments come and bail out the big financial institutions, it promotes an even bigger appetite for risk-taking. And now the risk-taking’s about food. GHOSH: Exactly. So, you know, what is really scary about all this is that the food market, the world trade market in food, has started behaving like any other financial market: it’s full of information asymmetry; it’s full of moral hazard; it’s full of, you know, herd behavior of the players. So it’s—. GHOSH: Absolutely. And, you know, you get all the misleading and wrong price signals. So farmers think, "Well, wow, the price of sugarcane is really high," and they go out there and cultivate lots of sugarcane. By the time their crop is harvested, the price has collapsed. So you get all kinds of misleading price signals. Farmers don’t gain. Meanwhile, consumers don’t gain, consumers lose out, because what has been very strange, especially in the developing world, is that when world trade prices were rising, prices rose everywhere in the developing countries. When world trade prices were falling, prices haven’t fallen. Consumer prices for food haven’t fallen to the same extent. JAY: It’s kind of a perfect storm for ordinary people, because if another food surge price bubble begins, it’s taking place at a time of terribly high unemployment and, a lot of people think, a lot worse unemployment still to come. In the next segment of our interview, let’s talk about what we can do about all this. Please join us with Jayati Ghosh on The Real News Network.